REELRADIO - The Don Jennett Collection! 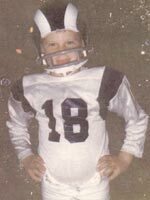 Don Jennett, Christmas 1969, in his new Roman Gabriel Edition RAMS uniform. 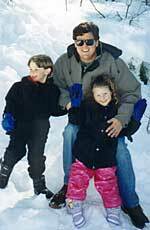 Don with son Calvin and daughter Victoria, January 1999, north of Nevada City, California. Don Jennett was born in Los Angeles in 1962, and is an avid collector of Los Angeles airchecks. Many L.A teens grew up with Boss Radio 93/KHJ. But in 1969, Don was only seven years of age when he was first hooked on KHJ. As an adolescent, he made all-too-brief airchecks of KHJ, KFI and 10-Q. He was unaware that the tapes would become collectibles, so not much survives from that era. His collection, as presented here, was built virtually from scratch. 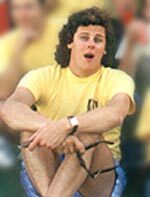 Don dreamed of being a "Boss Jock" or a journalist while growing up, and was schooled in newspaper journalism. He was Entertainment Editor and Radio Critic for the Cal State Long Beach Daily Forty-Niner during his college years. He became aware of aircheck collecting as a hobby in 1991, when he stumbled upon KRLA's April Fools' day broadcasts of classic DJs like Dave Hull, Emperor Hudson, Bob Dayton and Charlie O'Donnell. 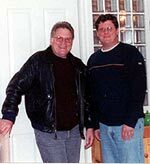 Bobby Ocean and Don Jennett, April 2001, San Rafael California. His career path took him into the world of advertising sales. He moved to Nevada City, California in 1998, where he worked as a publisher's representative. Don's only hands-on contact with radio  other than being a former groupie  was as a volunteer broadcaster at KVMR-FM, public radio in Nevada City. The Repository thanks Don Jennett for sharing!
. . . You betcha! Have a Burgie tonight . . . The majority of Reb Foster's career in Los Angeles was spent at KRLA, but he worked afternoon drive at KFWB in 1965 and 1966. Prior to Los Angeles, Foster worked at KYA in San Francisco, KISN in Portland and KYW in Cleveland. He owned a nightclub in Redondo Beach, and in the '70's, he managed Three Dog Night, the Turtles and Steppenwolf.
. . . Folks, if I told you what was taking place right now, you wouldn't believe it in a million years . . . The final trip into the depths of "The Diamond Mine," on KBLA, at least. Dave Diamond's rep for playing album versions of Top 40 songs set KBLA apart from its more powerful competitors  KHJ, KRLA and KFWB. No doubt there were some "open containers"  among other things  in the studio that night. After Diamond left the air, KBLA became KBBQ, playing country music until September 2, 1972, when the station again changed call letters to KROQ. Though Diamond stated herein that he was not going to be heard elsewhere, he did surface at KFWB a scant 11 days later, only to face another format switch and employment search the following March. An unscoped version of this aircheck runs three hours, and is available in three additional files.
. . . KHJ Star Trek Time on the Tom Maule Show . . .
Tom Maule (1939-1993) spent less than a year at his dream station, but his resume is nonetheless impressive. He worked at other major Top 40 stations both before, (KGB) and after, (KFRC) his brief stint at KHJ. Maule hailed from Fresno, where he both began and ended his career. He always gave his listeners the impression he was truly happy to be where he was. I am told this aircheck was provided by Tom himself. . . .KRLA proclaims January twenty-seventh 'Bee Gees' day in Southern California. . .
Bee Gees Day was coming - as evidenced by TWO Brothers Gibb tunes in this aircheck recorded during KRLA's "New Season of Excitement," a high-energy format which sounded very much like rival KHJ. Of course, by January of 1968, KHJ had lapped KRLA (and everyone else!) in the ratings. The DJ lineup at this time included Reb Foster (PD), Casey Kasem, Jim Wood, Dave Hull (in morning drive), Bill Slater and Rhett Walker (a New Zealander who was KRLA's answer to KHJ's Tommy Vance and KFWB's Lord Tim Hudson). Bob Dayton (1934-95) left WABC in 1965 after the infamous "Hiroshima" broadcast and headed west, first stopping at KBLA in Burbank (later KBBQ and then KROQ), where -- as evidenced by an aircheck elsewhere at this site -- he "puked" for two years. Reb Foster hired him the day KBLA folded, and by 1968 he had toned it down to at least "Boss Jock" level. In early '69 he even went up against The Real Don Steele in KRLA's afternoon slot. The "New Season of Excitement" ran out of gas, however, and by mid-1968 KRLA had all but conceded that KHJ ruled the town, giving way to large chunks of "automated" programming. Dayton stuck with KRLA off and on through 1973 (including a brief run back in New York at 'CBS-FM). He died of cancer April 28, 1995.
. . . that's The Balloon Farm, setting my thermometer on fire . . .
Before he was called up to KGB by Bill Drake, 23-year-old Bobby Ocean spun Boss platters and doubled as his own newsman under the moniker Johnny Scott at KY-NO Number 1 in Fresno. This recording was made by my friend Marty Levy, who explained the reason he ran valuable tape on this rather "new" radio voice was that "I knew someday he'd be a major market talent." Marty has since changed his name to Carnac.
. . . The final hour of music sounds from KFWB . . . Ever the consummate professional, Gene Weed (1935-1999), one of the only two remaining original "Seven Swinging Gentlemen," brings down the curtain after 10 years, 2 months and 8 days of what was initially called Color Radio. A certain highlight is Weed's recitation of the names of 50 personalities (all male, by the way) who used a KFWB microphone between 1958 and 1968.
. . . remember cousins, when you brew coffee at home, always start with a clean coffee maker. Make sure she washes her hands . . . Since I grew up on the left coast, I never got to hear Bruce Morrow until my first visit to the Big Apple in the early 1980's. He was every bit as popular in New York as Don Steele was in Los Angeles, and deservedly so! Also included: School Scope for Brooklyn Technical High School.
. . . Country Joe's is located at 2113 Stoner Avenue, uh huh . . . Here's some of Jimmy Rabbitt's final show on KRLA during their Phase 1 format. Phase II was launched when Shadoe Stevens joined KRLA as Program Director later that year. Following this stint, Rabbitt joined B. Mitchel Reed at album-rocker KMET, then moved to country KBBQ, where he stayed on for the switch to KROQ in September, 1972.
. . . where you're never more than a minute away from music . . .
Paul Freeman and Lloyd Lindsay Young, from a June 1970 KNAK Survey. 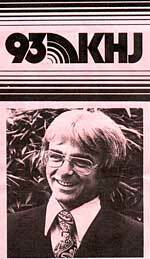 Here's Los Angeles radio veteran Paul Freeman on KNAK (1280 Khz) in Salt Lake City, Utah during the Solid Gold Summer of 1970. This is an enjoyable escape to a time when hit records were all "about" 3 minutes. Top 40 stations in smaller markets could pay the bills with reasonable commercial loads and the format comfortably blended rock, R&B and Pop. This was not "diversity". It was plain old "variety". Smaller market stations that got this good at their craft were still making exciting radio - and payroll. Even more appropriate for the date of the online debut, within the last 60 seconds of this salty treasure you'll hear a spot for Beneath the Planet of the Apes. It's 31 years, one month and a couple of days after June 27, 1970  and some things never change!
. . . 7:57 on the 'Roq,' and let's throw some Jim Wood on the fire and BURN! . . . Practically everyone who listened to "Big Jim" Wood (1932-1990) on KGFJ, the top soul station in Los Angeles in 1966-67, assumed he was black, as did many who heard him on KBLA, KRLA and, here, on KROQ. Of course, Jim Wood was white, but the sound of his voice earned him the politically IN-correct nickname "The Vanilla Gorilla," which for obvious reasons was never used on-air. For my money, Wood ranks in the very top echelon of Los Angeles DJs, and would certainly be in my "Dream Team" lineup with Robert W., Real Don, The Hullabalooer, Gary Owens, the Emperor and Humble Harve. Listen closely for his trademark finger-snapping (usually accompanied by a joyful yet guttural "HEY-Y-Y-Y! "), which must have caused many an engineer to cringe as the mic level went momentarily haywire. This particular 90-minute segment, from Halloween 1972, has Wood in fine form, clearly happy to be working again. Alas, like his all-too-short stint at KRLA, he didn't stay long in KROQ's ill-fated all-star lineup of jocks  Charlie Tuna and Jimmy Rabbit (who are heard in the "Ultimate 'Roq' Concert" promotion in this aircheck), Sam Riddle, Jay Stevens, Johnnie Darin (PD) and the late Steve Sands. Eventually he hooked on with "Border Radio" XEPRS, but developed emphysema while working as a security guard and passed away in 1990. Don Jennett contributed a shorter version of this orignally, and we published a 'scoped exhibit in June, 1999. 14 years later, Rob Frankel discovered and contributed this longer, partially restored version. REELRADIO updated this exhibit on October 27, 2013. [from Uncle Ricky]: An unscoped version of this aircheck, over five hours in length, was presented in a non-stop loop for December 29-31, 2000 and most of January 1, 2001. The following descriptions are by contributor Don Jennett.
. . . back in May, when CCR still existed . . . The "Big 93" of 1972 would prove to be the sixth and final one for Robert W. Morgan, The Real Don Steele and The Johnny Mann Singers on KHJ. I vividly recall 28 years ago my friends and I writing down each and every song in this countdown as it was revealed. RWM sounds as though he understood at this time that the official end of the Boss Radio era was finally at hand. Very few spots here (even for a Saturday morning), but the "Big 93" jingle is intact. This segment features Hits #93 through #67. Listen for an extremely rare "KHJ News Bulletin" (from newsman Bob Lee) announcing the resumption of the Paris Peace Talks.
. . . let's end the suspense right now . . . This segment features Hits # 31 - #1. After the "giant-killer" for the year is announced, it all begins anew with the #93 song.
. . . The Real Don Steele, out to spread your dayparts . . . This delightful 38 minutes of KTNQ/Los Angeles (10-Q) is a reminder not only of the high-energy talents of The Real Don Steele, but of the joy of listening to hot AM Top 40 in the late 70's. Steele was really "on" this Spring afternoon. He's fun and funnny, and it's contagious. Even his weather forecast will crack you up.
. . . a Ribbon In The Sky, well, at least it's not a rope . . .
Mark McKay pulls over an "old green Toyota" and awards $1000 to a very excited and cooperative winner. (They could only hope he had a diary!) There's a promotional announcement for KFRC Halloween fun, and this is a very listenable 42 minutes of a classic DJ on a classic radio station about twenty years ago. No diversity here, just variety and great showmanship. Someone always asks whenever we post an aircheck of Jackson, so as of this posting in April 2002, Jackson Armstrong was working morning drive on an FM station in Greensboro, N.C. He's been there for several years. In addition, as of January 2003, he started recording voicetracks for WWKB in New York. But on October 28, 1982, he was on KFRC in San Francisco.